With any major home construction project a good deck design starts with a firm foundation. Deck designs, or a contractor, that simply suggest constructing the deck on level soil, or resting it on a few level concrete blocks, aren’t worth their salt and should be avoided at all costs. I guarantee you that within a few weeks or months of not situating your deck on a solid foundation your deck will be unlevel to the point that it may be completely unusable. One winter season will absolutely cause your newly constructed deck to heave and sink. To build a firm deck foundation you first need to dig, and dig deep. It is important that the base of the foundation or deck piers sit below the average frost line for your climate area. If you do not do this, the freezing and unthawing soil will push up on the base of the foundation walls or deck piers and cause them to heave and sink. And the heaving and sinking never occurs evenly, which ultimately causes the deck to become unlevel and useless. 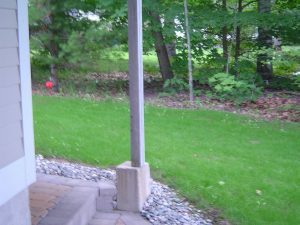 Besides starting the deck piers or foundation bases below the average frost line for your area, it is also important that they extend upwards above the ground level. They should extend out of the ground at least 8 inches from the lowest point of the deck to ensure proper drainage and to protect the lumber from ground moisture damage. The finished level of your deck however should not be higher than the entrance to your home. Otherwise you may have a problem with water running off the deck and entering your home. Your deck design could include foundation walls, sono-tubes filled with concrete, or pre-cast concrete piers. All are acceptable, however the sono-tube approach is probably the most common. The diameter of the sono-tubes or deck piers used depends upon the expected weight of the deck and the size deck posts you plan to use. The sono-tubes can be inserted into the ground after digging the holes using a post-hole digger. The concrete can then be poured into the sono-tubes. The installation of pre-cast concrete deck piers, as well as putting in a full foundation, requires the use of a backhoe and/or excavator. Another factor in deck design and firm foundations is to make sure the deck posts are anchored to the foundation, deck piers, or sono-tubes with non-corrosive fastening brackets. They also help to protect the base of the deck posts from water damage. Finally, before breaking ground on your new deck, make sure to visit your local building inspector to have him review and approve your deck plans. He can also provide you with the information you need on how deep to dig your holes or deck foundation walls. Upon granting his/her approval, he/she will provide you with a building permit that you’ll need to keep posted near the deck construction project. 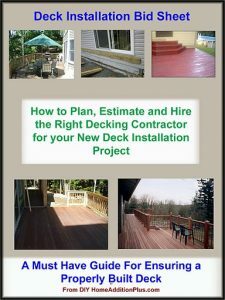 The building inspector will also want to come out and expect your deck project during various phase of the construction.